Stella Abraham: Even Real Estate Companies move house! Even Real Estate Companies move house! In a couple of weeks CB Richard Ellis will be moving house! For all of those non Hong Kongers amongst us, click on the address to take a look at the building......certainly in a convenient location! In Hong Kong, it is common practice to bless a new home or a new business - Yes! When you spend that much time at work as people do here in Hong Kong then that becomes your home as well! In return for good business, nice things are offered to the gods and funnily enough food is one of these things! Roasted pig is a popular choice (sorry all vegetarians out there!) 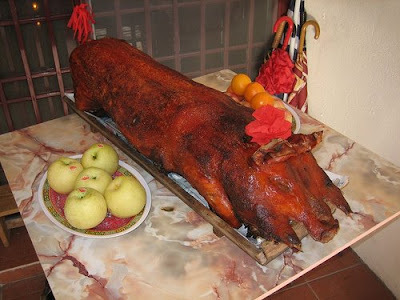 The reason is an auspicious one.......when cooked, the pig turns red.....the most auspicious colour!